Survation on behalf of Bright Blue conducted an in-depth study of ethnic minority voters’ attitudes to immigration to inform their report A balanced centre-right agenda on immigration: Understanding how ethnic minorities think about immgration. Survation polled 1,231 British BME adults via online panel from February 16th – March 5th 2015. The study found that, when asked what an ideal immigration system is, ethnic minorities are more concerned with having a well-managed immigration system (40%) and a system which admits immigrants who will contribute to the UK (25%) than one with fewer (10%) or no new immigrants at all (7%). In terms of immigration policies, the one which ethnic minorities would most like to see introduced to improve the immigration system is increasing the time before new immigrants can claim benefits (43%), followed by a policy which would increase border policing to cut down on illegal immigration (36%). Both of these policy proposals were far more popular among ethnic minorities than tightening the immigration cap on non-EU migrants (22%) or withdrawing from EU free movement of labour rules (16%). Ethnic minorities are more welcoming of different types of immigrants when compared to the wider population; 93% of ethnic minorities do not want a reduction in the number of international students coming to the UK, 92% do not want to see fewer professional workers coming to the UK and 84% do not want fewer skilled manual workers coming to the UK. Across all types of immigrants, ethnic minorities are more likely to say that their numbers should not be reduced than the wider population. 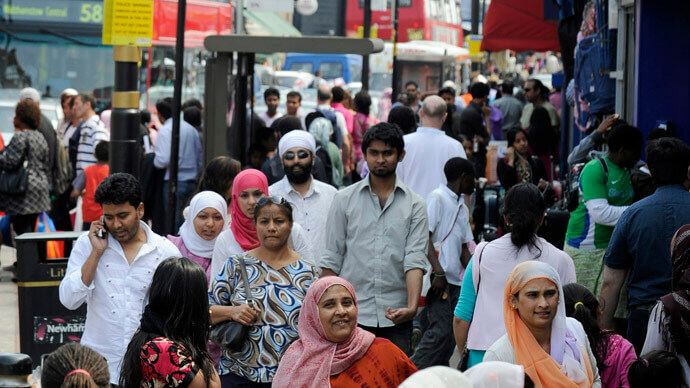 Ethnic minorities are also more positive about the economic and cultural impact of immigration when compared to the wider population; nearly three-quarters of ethnic minorities agree that immigration has provided skills for our economy (72%) compared to under half of the wider population (42%); almost two-thirds of ethnic minorities agree that immigration has enriched British culture (65%) compared to just over a third of the general population (34%); and more ethnic minorities agree that immigration has helped support our NHS compared to the wider population, although the gap is smaller for this particular impact of immigration (52% compared with 40%, respectively). Furthermore, ethnic minorities are more likely to believe that immigrants are integrating. Nearly three-quarters of ethnic minorities think that most immigrants prefer to be in work than on benefits (73%), compared to under half of the wider population (46%). Over two-thirds think that most immigrants contribute tax (69%), compared to just two-in-five (40%) of the wider population. However, under half of ethnic minorities think that most immigrants speak fluent English (47%); yet this compares to just over a quarter of the wider population (26%). When looking at immigrants specifically, an overwhelming majority (93%) are proud (either very or somewhat proud) to live in Britain. A further 87% of immigrants feel respect for the British political system. Moreover, in terms of social mixing, most immigrants participate in a range of local activities, with half saying that they go to the pub with friends or colleagues and only slightly fewer (47%) saying that they participate in local community organisations. Bright Blue‘s report concludes that ethnic minority views of immigration represent a political opportunity for the centre-right. Changing the party’s immigration policy is one of the top changes (24%) which would encourage ethnic minority individuals not currently seriously considering voting for the Conservative Party to consider it, behind only changing NHS policy and changing economic policy. Full data tables can be found here and here. Bright Blue‘s analysis of the findings can be found here.